Join the Doves Studio for the last beach clean-up for the summer! I live in Brentwood and you would think that my apartment building would have a recycling bin. Well, it doesn't. So, every week I carry my recyclable items to work with me and recycle them in the bins there. I know I probably look like a bag lady, but taking a little social responsibility is that important to me. I reuse the paper bags, but an even better alternative is to keep all recyclable items in a plastic container. So, then you are always reusing the container. This book overall allows for a consumers voice and provides you with some food for thought. Thanks to Ms. Laura Crogan, I'm in love with my JBrand Jeans. The best part about JBrand is their "Green Label". According to JBrand, "Green Label is made with 100% organic cotton with washes that use vegetable dye to reduce the ENVIRONMENTAL IMPACT." Go to JBrandjeans.com and check out the Green Label. It's never too late to be fashionable and eco-friendly. If you haven't tried VeeV you're missing out. My gal pal Kasey Blaustein has introduced me to probaly one of the best spirits out there in my opinion. VeeV is one of the first acai spirits. The company is carbon neutral and eco-friendly. The best part is that $1 per bottle goes to Rainforest Preservation. GO ONLINE TO VEEVLIFE.COM Drink responsibility and don't drink and drive! So for those of you who haven't jumped on the bandwagon of bringing your own bag when you shop, it really can be easy. I just received this reusable bag from Heal the Bay and what I love about it is that it folds up into a medium size wallet and is small enough to throw in my purse. I now have no excuses for forgetting my reusable bag when I shop. Way to go to Mr.Smith for taking some social responsibitliy without even knowing it. He picked up a wine rack at his local Goodwill, which is great because he is reducing the amount of waste in the environment by reusing. He also has created his own green garden at home and he is reusing his glass jars to place herbs in and store spices. Watch out people, this man is on a mission! Keeping the TRASH off the streets. Here's what Miss Marcey Logue wanted to share:"This is the lady I was telling you about. Her name is Joan, she is a crossing guard at Moorpark between Fulton and Woodman. She is out there Monday – Friday rain or shine with her little jacket and her broom and dustpan. She cleans both sides of the streets keeping the litter off the streets and out of the storm drains". 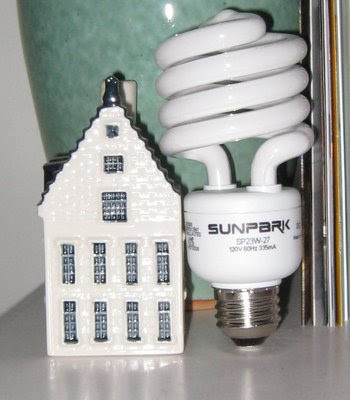 How many CFL's do you have in your home? Thanks to Marcey, I have an eco-friendly commuter mug that I sip my delicious Yogi green tea from. I haven't had coffee in three months and I don't miss it. Gotta love it! I was on my way to Manhattan Beach from Brentwood when I noticed these newly placed trash bins on Barrington Avenue towards Sunset Blvd. I was pleasantly surprised to see a recycling bin. You have no idea. Then, as Jolene and I were leaving the Shade Hotel in Manhattan Beach after having lunch I saw the same style type of recycling bins in Manhattan Beach. Amazing! I woke up this morning and was too lazy to rinse my plastic container out and recycle it! Shame on me! So, my wonderful roommate, Amber, pulled it out of the trash and recycled it. She gave me a "Green" ticket. The fine was to buy her a bottle of wine. I will never do that again. As a hairstylist working in Santa Monica at Doves Studio, I have observed the need to create a local composite site for hair clippings to be collected as a way to “green” my community. Hair clippings are used to create hair mesh mats, and since hair naturally absorbs oil, this the most organic way tool for soaking up oil spills. Current methods, such as chemical dispersants, can actually be more harmful than the spill itself. A local composite site is necessary as the only company that facilitates such work is Matter of Trust, which is located in San Francisco. Funds would be used to open a facility that would support a natural surplus program. I would partner with Sustainable Works, a non-profit organization promoting sustainable practices in urban environments, to develop and implement a site similar to Matter of Trust in Santa Monica. Over 100 salons exist in Santa Monica and this site will make it convenient for them to become ”greener.” Local salons would have a place to donate hair and we could extend the awareness to local cities such as Malibu, Venice and Marina Del Rey. Santa Monica is already focused on reducing the city’s carbon footprint, making this a great addition to city standards. This effort could also promote other business sectors to be environmentally responsible in their operations. As the only salon in the Business Greening Program, Doves Studio is a leader committed to greening our community and will use these funds to expand these efforts. It's about that time again. The Doves Studio is having their second beach cleanup on June, 14th at 5pm and would love for you to join us! Visit nleal.blogspot for more information or call the Doves Studio at 310.399.7654. Ok, so this might be a little over-the-top. Or maybe not? I'm really trying to REDUCE the amount of stuff I throw away, so I bring my own containers from home to the farmers market. Makes complete sense to me. I no longer take a plastic bag for my greens. I bring my own container for my berries and tomatoes. The best part part is walking down to my local farmers market and supporting the local farmers. It's also the best place to pick up fresh, beautiful and affordable flowers!